Google users have become accustomed to the Google Bar when they visit the search site. It's that dark bar on top of the page with all sorts of menu choices that take the Google user to various Google products like Gmail, Documents and more. Now Google is planning to get rid of that dark bar on top of the browser in favor of an all new approach. In a post on the Official Google Blog, the company revealed that instead of a dark bar, users will now move their cursor to the Google logo on the top left of any Google page. That will bring down a menu that will give access to most of Google's features and services. Besides the logo, the only things on top of the page will be the search bar and a link to a user's Google+ tools such as sharing and a user's number of notifications. You can check out how the new Google Bar (which isn't really a bar anymore) works via the YouTube video above. This new change is just the latest in a series of refinements for Google's various services. 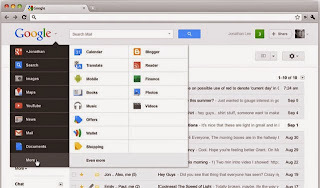 Recently it made some changes in the layout for Gmail and also made some improvements in its Blogger web blogging tools. Google has also been active in shutting down a number of services and business divisions over the past several months, including some more announcements of various Google services that were made last week.